Of all the Underground's abandoned stations, one looks more deserving of its fate than most. Blake Hall was less a station and more a halt in the middle of nowhere. 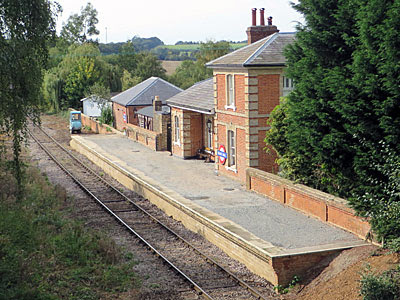 It was located at the far end of the Central line, about halfway between North Weald and Ongar, on a remote country lane in the rural south of Essex. Trains paused regularly to open their doors to birdsong, if not to passengers, then clattered off across the fields to fractionally busier platforms elsewhere. It's said that Sir John Betjeman's dream job would have been to be the stationmaster here, holed up in a redbrick house that could have been 200 miles from the City but was instead swiftly connected by train. By 1981 Blake Hall famously boasted only six passengers a day, a fact which makes perfect sense if you've ever visited the spot. And when economic truth finally caught up with this humble backwater, the trains still clattered by, but the birdsong went unheard. After closure those half dozen passengers found other ways to travel, probably involving cars, and the station building was sold off as a private residence. Trains still ran by, peak hours only, and the platform was subsequently removed in case drivers ever felt tempted to pause and let a sneaky traveller disembark. Things must have got quieter still in 1994 when the entire branch line closed, and then very slightly busier again ten years later when the Essex Ongar Railway began tentative services. The line's owner loved Blake Hall's railwayside isolation so much that he bought the place, and now lives behind grand gates at the foot of a long drive in a somewhat extended house. Last year he even rebuilt the station's platform, not so that scheduled steam trains could stop, but I suspect the odd special pauses here out of hours when nobody else is looking. By rights Blake Hall station should never have been built. When the railway came to Ongar in the 1860s the local landowner had insisted that a station be built to serve his stately pile, a 36 bedroom mansion that's not actually anywhere near the railway. Blake Hall (for that was its name) lies over a mile away in the village of Bobbingworth, exactly the same distance from its own station as it was from Ongar, just to add to the pointlessness of construction. It would have made better sense to name the tiny halt after a closer village, or rather hamlet, of which there were several. Greensted Green would likely have been the winning candidate, but I'd love to have seen Upper Bobbingworth Green on the tube map, or better still Toot Hill. All of which correctly suggests that reaching the site of Blake Hall station these days is a bit of a challenge. If you've got a car, fine. Take the winding lane off the A414 and drive down to the humpy bridge across the railway, then look for somewhere to park. If it's the weekend you might get away with pulling up in the forecourt of the only other building hereabouts, that's Stationbridge House. This metal shed looks like it'd be more at home in Debden, and serves a company that supplies disposable cleaning, catering and hygiene products - that's paper towels and plastic cutlery to you mate. I suspect they have enough employees to have more than doubled passengers numbers at the station across the road, if only it had stayed open, or run at sensible times. Or you can catch the train and then walk. Normally the nearest station's in far-off Epping, but that's not a problem because this is the starting point of the Essex Way, an 82-mile waymarked trail to Harwich. Toot Hill comes about five miles in, from which you can walk another mile up the lanes to Blake Hall bridge. But on EOR days you can walk in direct from North Weald or Ongar, each in this case about an hour distant. I'd recommend Ongar, partly because you follow the Essex Way for longer, but also because roughly halfway you pass the oldest wooden church in the world. St Andrew's Greensted includes 51 timber planks that predate the Norman Conquest, although there's evidence of 6th and 7th century wooden structures beneath the chancel. Step inside and it's gorgeous, all atmospheric beamwork and stained glass, plus a table of jams and preserves for sale at the back. Or you can catch the bus. 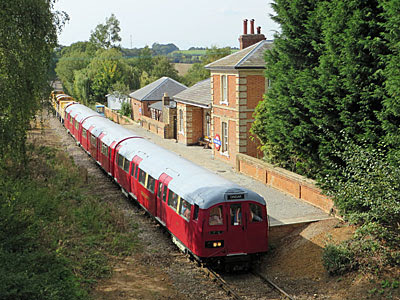 Toot Hill merits a tiny number of buses a day, but on Sundays the Epping Ongar Railway run three heritage services on route 381, departing North Weald as part of your general admission. They use an old Green Line coach, beautifully restored, which hurtles round a circuit of narrow lanes no double decker could cope with. On Sunday the bus was packed out, but that was because the End of Tube event coincided with a mass gathering of old vehicles which many came specifically to admire. The main draw was an extra-rare line-up of the first four Routemaster prototypes, which excited the MWLB beyond compare, while the more Essex element of the audience were more thrilled to see a silver New Bus For London from Bow Garage. I caught the 381, and persuaded the driver I wanted to alight at Blake Hall. I wasn't the first - a number of other folk had made the same journey by other means, and were standing poised beside the low brick wall along the side of the bridge. There's only one decent reason to visit Blake Hall station these days, other than if you live here, and that's to watch a train go by. More to the point this weekend that meant watching a tube train go by, an occurrence not seen these past twenty years, hence the presence of several gentlemen with cameras and other filming devices. Breakdowns and delays meant we waited rather longer than timetabled, long enough to see a young man emerge from the station building and sit down on the platform with a snack and a bottle of Sarson's in hand. Too much information, I know, but that's what you get for sharing a vantage point with the owner of a telephoto lens. Eventually a tube train appeared round the bend, proper red end first, and edged closer to the Blake Hall platform. The bloke with the vinegar had gone back inside, as if living here made the passing of rare trains somewhat less special, thereby recreating the more familiar passenger-free scenario. Cameras flashed and lenses whirred to capture the moment, then the group dashed to the other side of the lane to watch the entourage continuing its journey towards Ongar. From this angle the deception behind the illusion was revealed, with four chunky yellow diesels shoving along the three carriages from behind. And as they sped off through the cutting and into the trees I smiled. I'd come all this way to the middle of nowhere to catch an impossible train at an abandoned station, and grabbed the money shot. We may not see the like again.